The third annual International Conference on Computational Social Science (IC2S2) was held in Cologne from Monday 10 July to Thursday 13 July. The conference bought together an interdisciplinary mix of social scientists and computer scientists interested in finding new ways to understand the world we live in. The studies presented were broadly focused on the use of big data sources (e.g. social media information, Wikipedia entries, sensor data) to investigate interesting issues in social science including political events, such as Brexit and the US election, fake news and social trends. 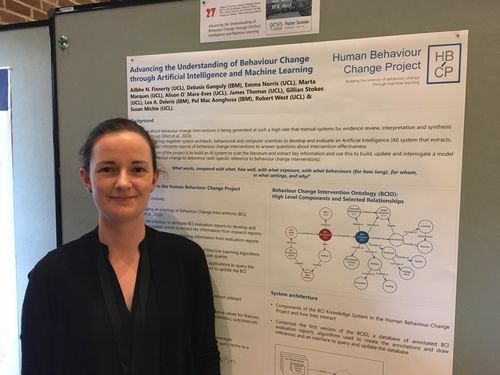 Ailbhe Finnerty (UCL) presented a poster about the Human Behaviour-Change Project (HBCP) on the second day of the conference. The HBCP poster presentation differed from many of the others due to the project’s focus on cutting-edge research synthesis methods. Ailbhe was able to have interactive discussions and exchange ideas with a wide range of researchers who informed her about relevant work, and recommended interesting articles and podcasts. Some of these discussions suggested potential avenues for exciting future collaborations with researchers who have developed tools that could make the work of the HBCP team much more efficient. The conference was organised by The Gesis Institute. Beyond facilitating interesting presentations and discussions around computational social science research, The Gesis Institute used willing conference delegates to gather big data for their own social science research. Throughout the conference, attendees wore sensors to detect how close they were to other conference goers, producing a rich set of social interaction data. This was an engaging and organic way to involve people in gathering valuable data, and left the participants keenly anticipating the results of future work. IC2S2 2018 will take place in Evenston, IL in July 2018. For more information about the conference, visit the IC2S2 website, and search the twitter hashtag #IC2S2.